It doesn't really matter how many times I've been to moody Glencoe or seen the shores of Loch Ness or taken photos of Eilean Donan Castle – there's just something about the Scottish Highlands that keeps drawing me back. The trip that made me fall in love with the Highlands was a 5-day tour with Haggis Adventures back in 2012. 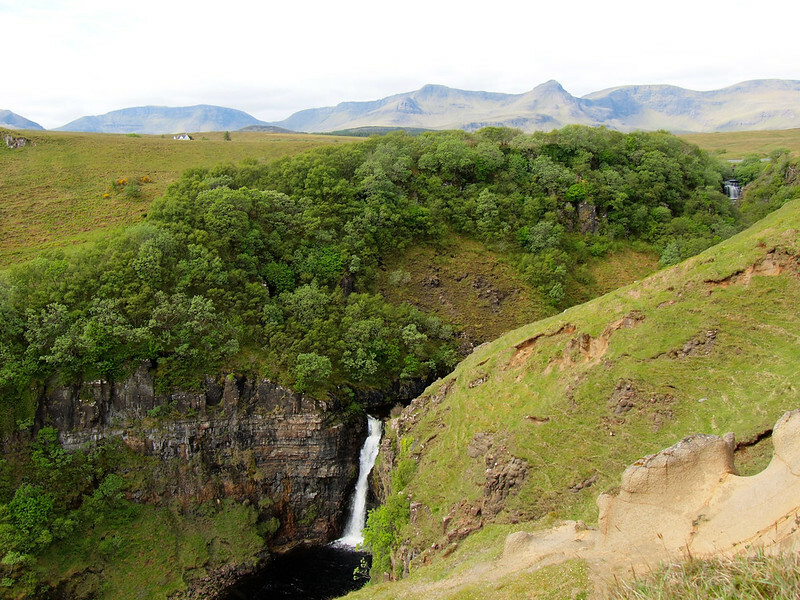 But that tour is definitely more for backpackers than moms, so I was on the hunt for a Highlands tour that wouldn't include drinking games or sleeping in hostels. I came across Highland Explorer Tours, which, as it turns out, is actually a sister company to Haggis! YES! I had such a great experience with Haggis 3 years ago that I didn't hesitate to book us onto a with Highland Explorer. And, yet again, I was not disappointed. Based in Edinburgh, Haggis and Highland Explorer share the same great, knowledgable guides and use a fleet of brightly-colored mini buses (yellow for Haggis and blue for Highland Explorer) to transport visitors all over Scotland. Just as when I traveled with Haggis, my experience with Highland Explorer was one of beautiful scenery and great guiding. The one major difference? This trip into the Highlands was full of SUN and warmer temperatures! We set off from Edinburgh in the morning, stopping for second breakfast in Dunkeld where we also had time to visit a ruined cathedral. 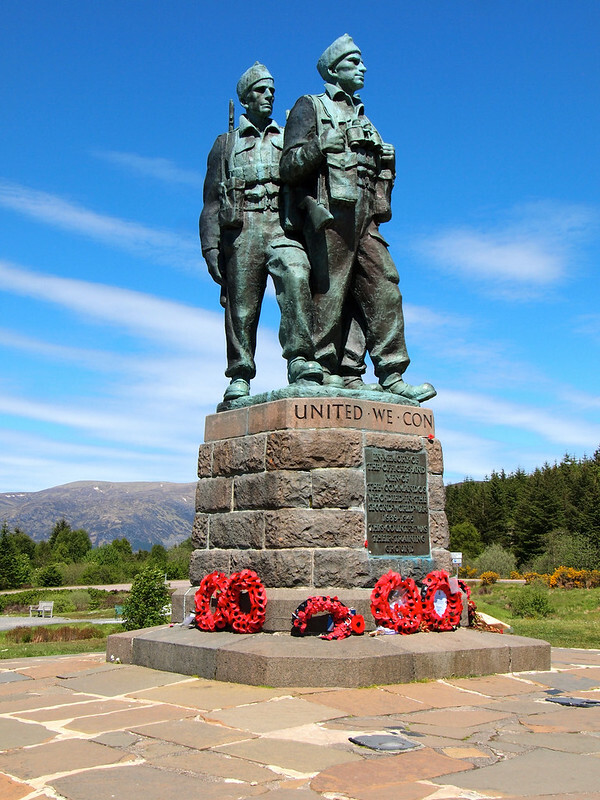 We stopped at a war memorial within sight of Ben Nevis (Scotland's tallest mountain), and had time to grab lunch on the shores of Loch Ness. 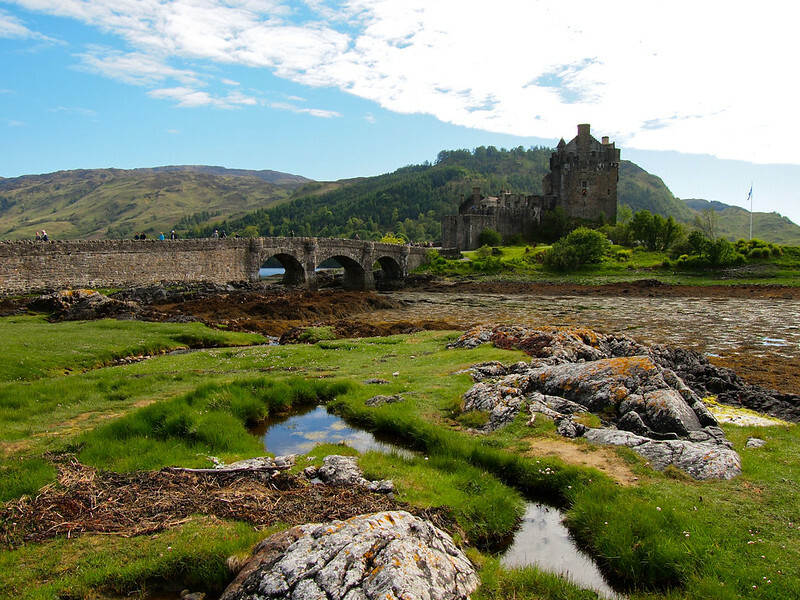 In the afternoon, we stopped at Eilean Donan Castle, the most-photographed castle in Scotland. We had enough time to tour the inside of the castle, but my mom and I skipped it since I'd already been before. (Entry is 7 GBP if you do want to go in.) Instead, we walked along the lake shore to take photos! Then we headed over the bridge to the Isle of Skye, arriving in the capital of Portree in time for dinner and some beautiful evening light. I climbed up a watch tower for a better view out over the harbor – I still can't BELIEVE we had weather this nice! Day 2 was ALL about the Isle of Skye. We saw the Old Man of Storr (which was cool because the last time I was on Skye it was too cloudy/misty to see it), the Fairy Falls, Kilt Rock, and also Lealt Falls. 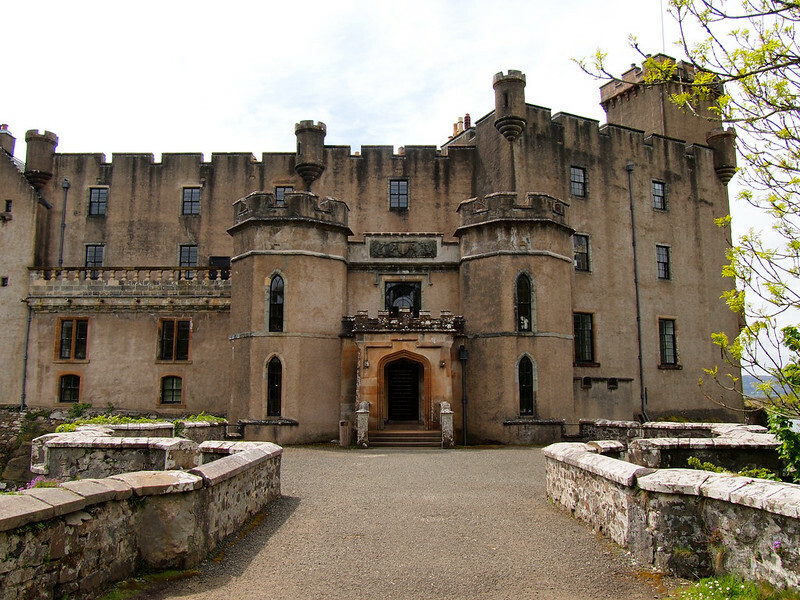 We stopped at Dunvegan Castle for lunch, and had time to tour the home of Clan MacLeod and its gardens. My mom really enjoyed this part, and for good reason – the castle was gorgeous inside! This was probably my favorite day of the tour, simply because the Isle of Skye is so stunning. Stay tuned, because I'll be writing more about this island soon! Our final day of the tour was no less jam-packed than the first two. 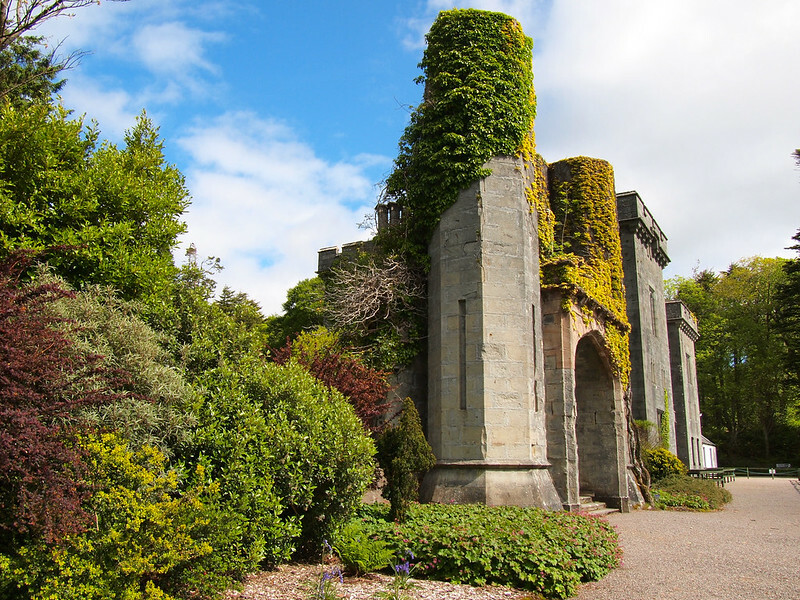 We started off with a visit to the museum at the Clan Donald Centre and ruined Armadale Castle, which for a long time was home to the Macdonald family. 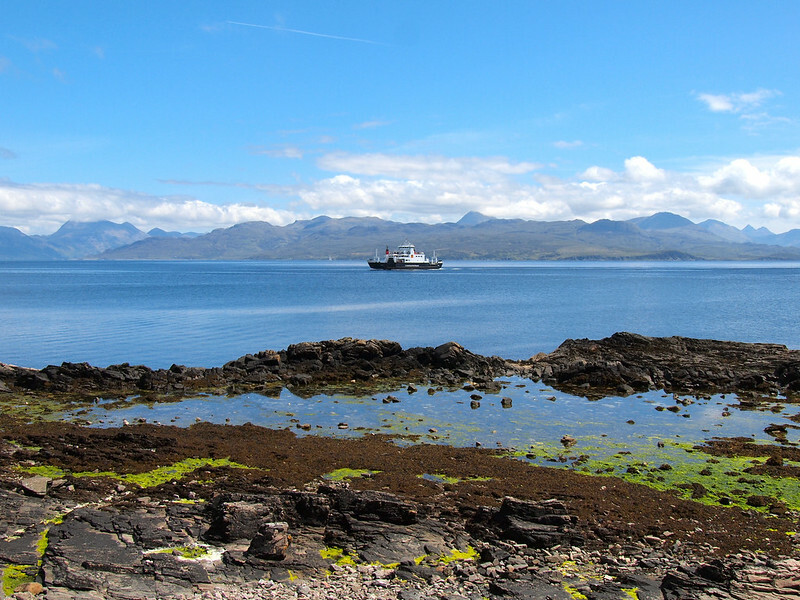 We then headed for the ferry terminal and hopped on a boat that took us from the Isle of Skye back to the mainland. The trip from Armadale to Mallaig was GORGEOUS – once again, the sun followed us on our journey. After the Jacobite, we made our way back to Edinburgh with a few more stops – including one at Glencoe, where a sad took place in the 1690s. Our guide was full of historical facts, and he told us stories about Glencoe, the Jacobite uprisings, and William Wallace on the way back to Edinburgh. When you go to book your tour, you'll be paying for your guide and transport, as well as your accommodation for two nights. Breakfast is included for two days, but you'll be responsible for the rest of your food/snacks. You'll also be responsible for paying for optional extras (in this case, like entry to Dunvegan Castle and the Jacobite Steam Train). Like I mentioned earlier, Haggis is geared towards backpackers. Highland Explorer, therefore, is aimed more at the non-backpacking crowd. Instead of hostels, you'll stay in hotels and B&Bs. The optional activities may be a little more low-impact. And you won't be guilted into drinking games or toga parties at night (though it was admittedly super fun when I was traveling solo three years ago). 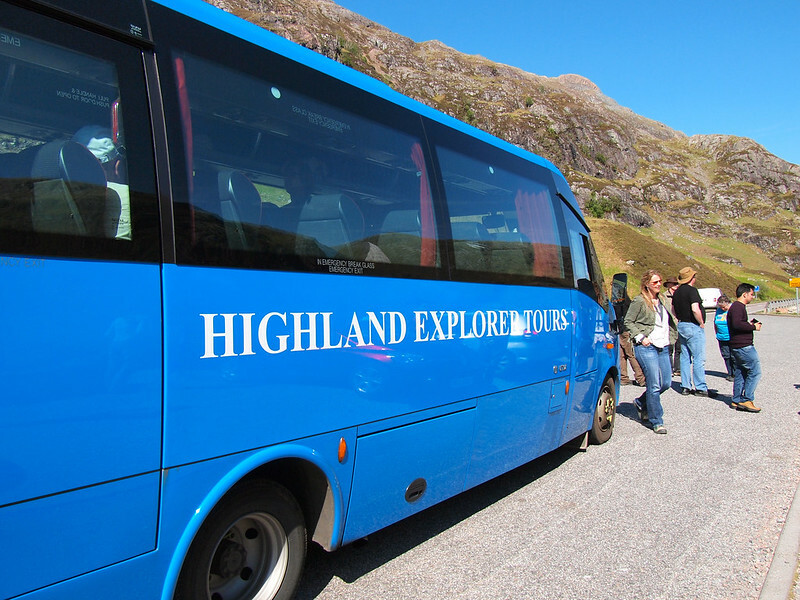 I won't say that Highland Explorer is more for the older crowd, because we had everyone from families with teenagers to university friends to couples (young and older) traveling in our group. I thought it was the perfect type of tour for my mom and I to go on together. We had a young Scottish guy named David as our guide. He went to university to study history, and was absolutely bursting at the seams with knowledge about Scotland and its history. He made our bus rides fascinating with his stories, and played lots of Scottish music in between. I've now been on a handful of tours with both Haggis and Highland Explorer, and I'll say this about their guides: they're all FANTASTIC. They all have their different interests and their different ways of guiding, but they all have one major thing in common: they really, really love Scotland and love sharing it with other people. We traveled via mini-bus around Scotland. The bus was comfortable and we stopped every hour or two for breaks – but be aware that you WILL spend a few hours a day on a bus on this tour. That's mostly because you pack a lot in to just three days – , the first day includes getting to the Isle of Skye, which takes at least 6 hours. 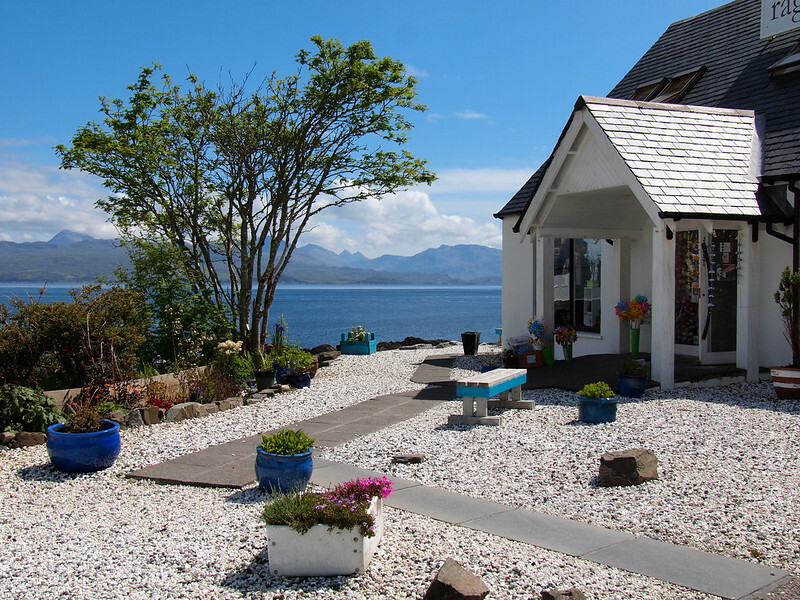 This tour includes two nights in Portree on the Isle of Skye. My mom and I stayed at the Rosedale Hotel right down by the Portree harbor (which is one of the hotels Highland Explorer recommends). The hotel used to be a handful of fishermen's cottages, and retains a lot of that old maritime charm. It also has a great restaurant up on the second floor. About half of our group stayed at the Rosedale, while the other half stayed at a locally-run B&B a little further away from the center of Portree. 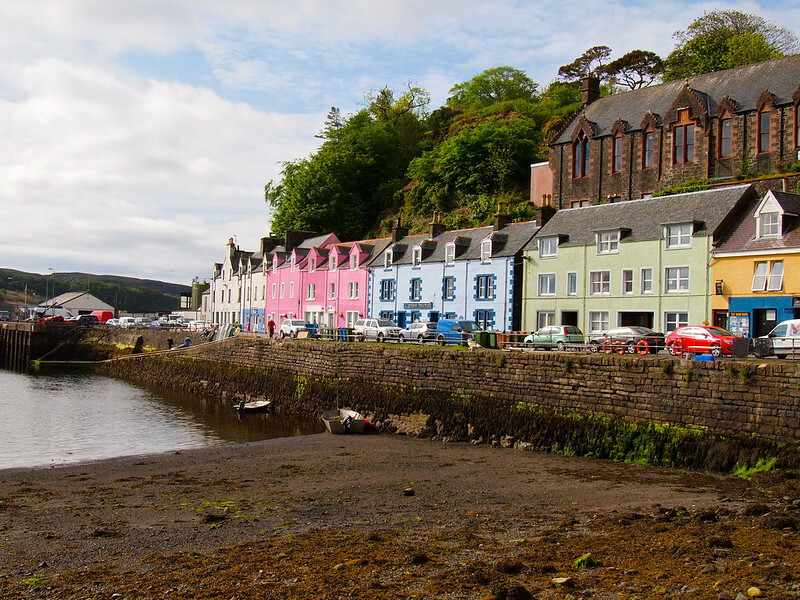 One tip about Portree: If you want to eat at any of the seafood restaurants down by the harbor, you WILL probably need to book a table ahead of time! We had a tough time finding a place to eat the first night we were in town and ended up just getting takeaway fish and chips (which was delicious, BTW). 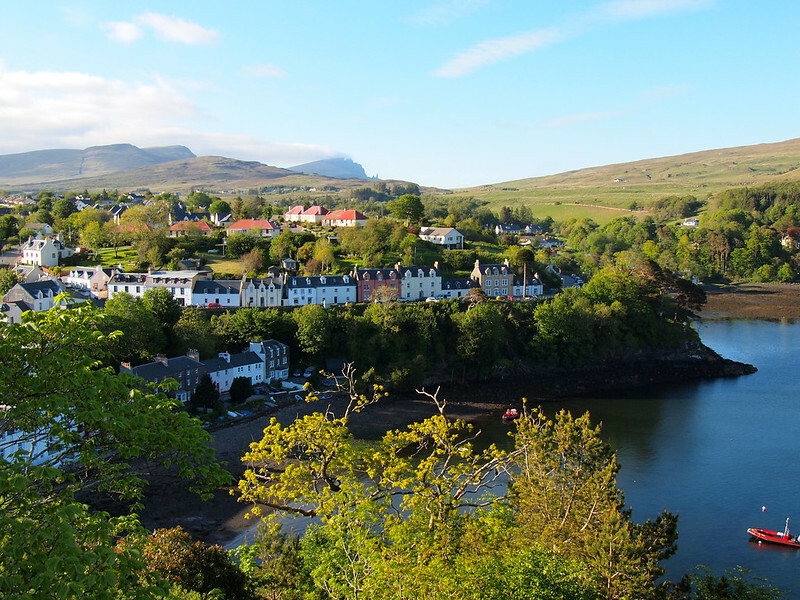 The view of Portree from the Rosedale Hotel. Short answer: YES. Like I said before, I've had great experiences traveling with both Haggis and Highland Explorer, mostly thanks to their great guides and great itineraries. Could you do a trip like this on your own? 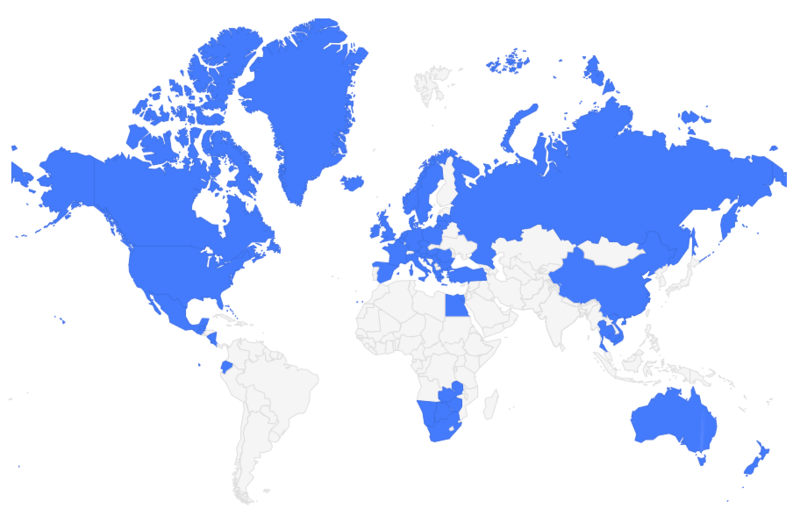 Sure, if you rented a car it would be easy to visit all the same places. But having a guide really can make a huge difference, and in this case I know my mom preferred riding in a bus to us driving ourselves around on Scotland's narrow roads. If you want a great taste of the Highlands but don't have a lot of time, is perfect. You see a lot of the highlights in just three days, and it doesn't cost a ton of money. How much: Twin shares start at $549 per person, which includes guiding, transport, accommodation for 2 nights, and 2 breakfasts. 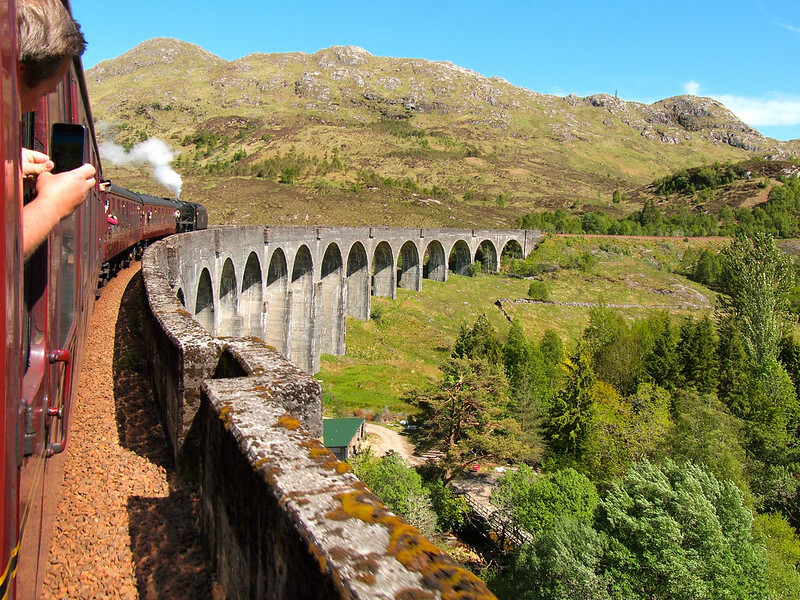 Optional extras include Dunvegan Castle ($19 per person) and the Jacobite Steam Train ($74 per person). When: This tour runs from April-October, with various departure days depending on the month. What to bring: They recommend a small bag weighing 15kg or less since the buses don't have a ton of storage space. A in case you hit cool weather. A (even better if they're waterproof). A so you can use/charge all your electronics in Scotland. 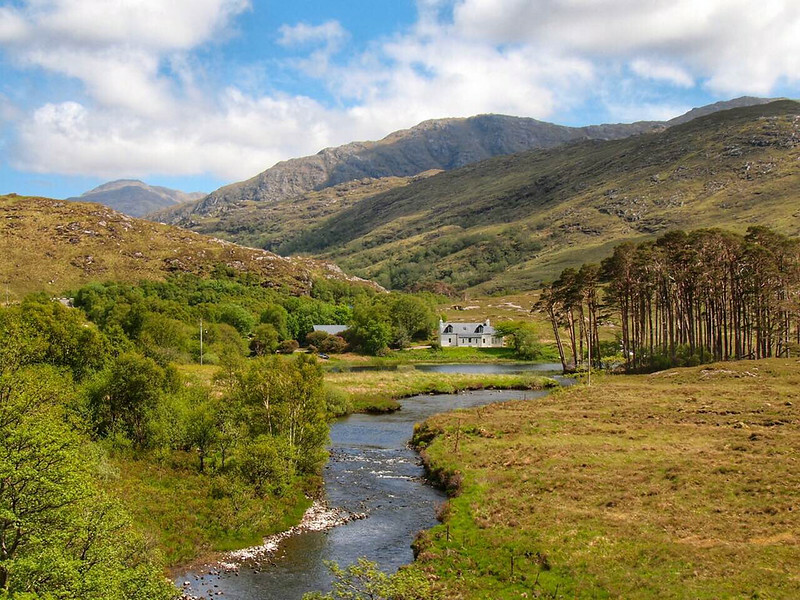 Have you ever been to the Scottish Highlands? *Note: Big thanks to Highland Explorer Tours for covering the cost of our tour and accommodation on this trip. As always, though, all opinions are 100% my own! What's it Like to Travel with Haggis Adventures? We were SO lucky with the weather! Though, I will say this: Scotland is stunning whether it’s sunny or raining! 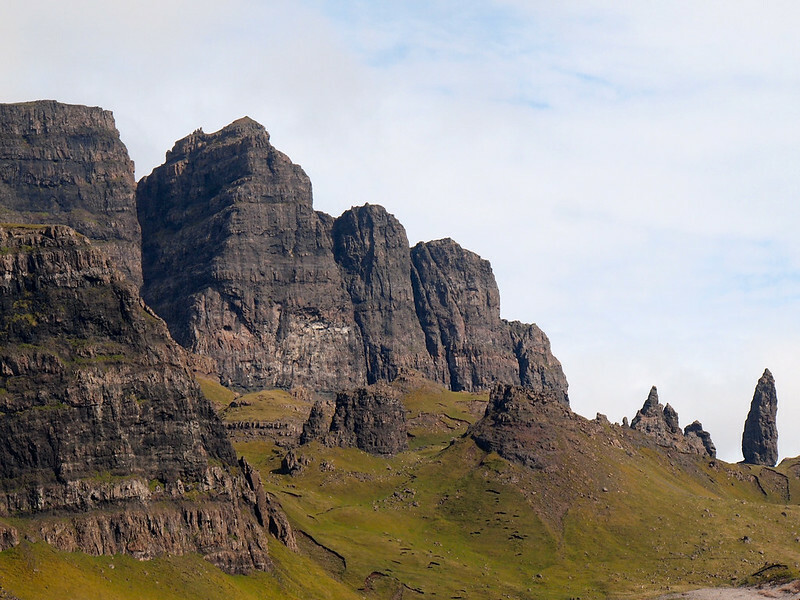 The Isle of Skye became my favorite part of Scotland 3 years ago – and on that trip I never saw the sun! I can’t get over your pictures! You were so lucky with the weather. I’m sure it will be much colder and cloudier when I visit in early October. I’m still very excited! I will definitely check out this tour next time as I’ll mostly be in Edinburgh visiting friends this time around. You know, I have absolutely no desire to go to Scotland but it’s my husband’s #1 place he wants to go in the world so I know at some point in the next 2 or 3 years we’ll get there. I’ll definitely be bookmarking this for our eventual trip! 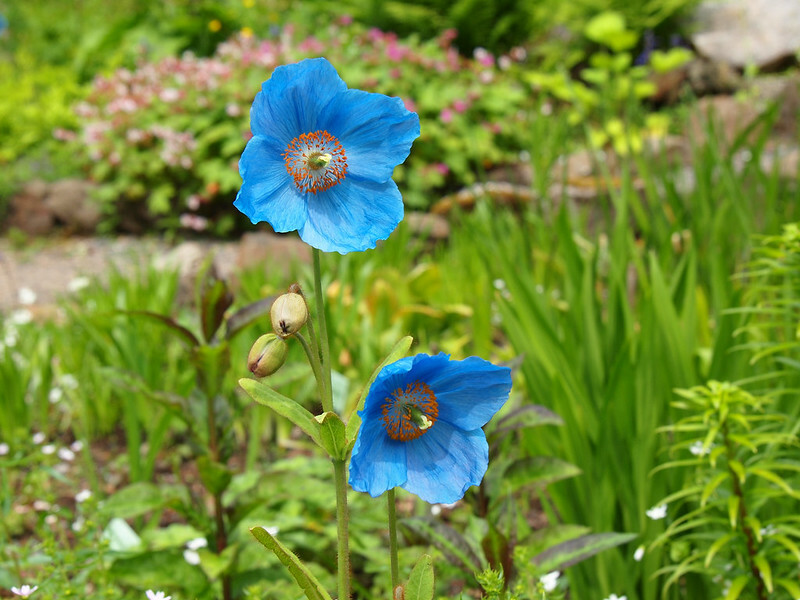 Did you ever go to the Shetland islands? I have not been to the Shetlands (or any of the Outer Hebrides, for that matter), but it’s definitely on my list! This sounds like such a great tour. 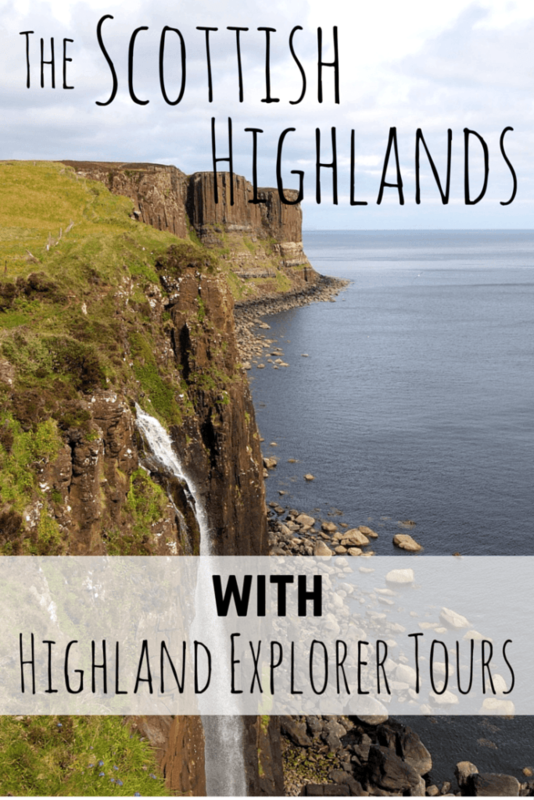 Having heard such great things about Haggis Adventures, I’d been looking for a tour company that was similar but less hostelly but hadn’t come across Highland Explorer Tours. They sound like exactly what we’re looking for! Very similar to Haggis, but just without hostels and not nearly as much drinking. 😉 Still great quality and I’d highly recommend them! Oooh a friend in Edinburgh! I love that city! Scotland is so pretty, and after reading the Outlander books and watching the TV show, it was added to must see list, of course. 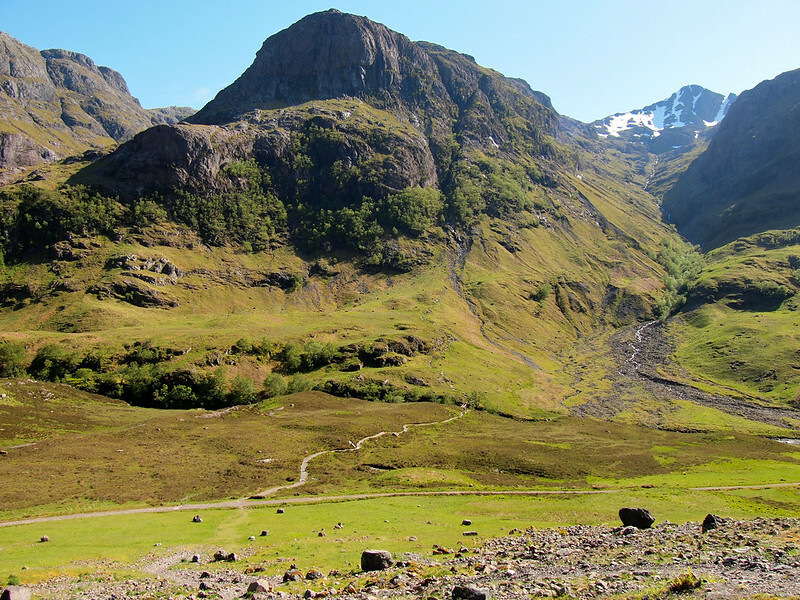 I would love to see the Highlands, because I’ve read so much about them, and because they look so beautiful! I really wanna return to Scotland! This sounds like a great trip to do with a parent! It was perfect for us! Enough scenery and interesting stops, but not too over the top for my mom. We both loved it! I have been to the Scottish Highlands. Many times and I really love it. I live in Germany but if I ever had to move back to the UK, it would be to Scotland! 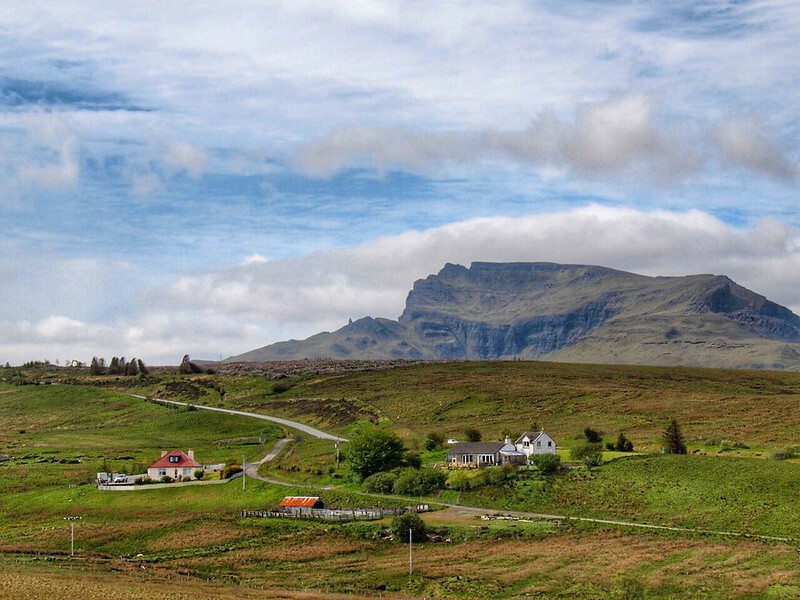 One of my favourite islands is indeed, the Isle of Skye and actually that photograph of “the view of Portree from the Rosedale Hotel” is where we too had our fish and chips on the stone wall. My son remembers it vividly, as the seagulls kept trying to peck his lunch away LOL! We went in the height of summer and stayed in the only double room, in the only hostel, in Portree at the time. The fact that they lost our booking and we had to sleep in the managers’ office is a post for another day… LOL! Haha, sounds like an interesting visit to Skye! It’s so gorgeous though… I’m already dreaming of going back again! I simply must make it to Scotland one of these days! Although I usually prefer to drive on my own, the tour looks like the perfect intro to the Highlands. For next year’s big trip, I chose SouthEast Asia over hiking Scotland with friends, so maybe I’ll get there in 2017?! I’ve wanted to visit Scotland for ages! Your photos are stunning; you certainly lucked out with the weather. Did you ever feel rushed on the tour? That’s my only issue with group trips like that (I like to have plenty of time to see everything, you know?). Lovely post, I can’t wait to see the next few! This was a pretty slow-paced tour overall. The only bits that were rushed were a couple stops on the Isle of Skye at some outlooks. There were so many people that there just wasn’t room to park the bus, so it was sometimes a quick hop off for a photo. Didn’t really bother me, though, because those spots were too crowded anyway! Sigh! The Highlands. How I love Scotland, let me count the ways. Can’t wait to go back in April. A Scottish MUST that so many people miss is the Isle of Arran. People call it Scotland in Miniature for good reason. 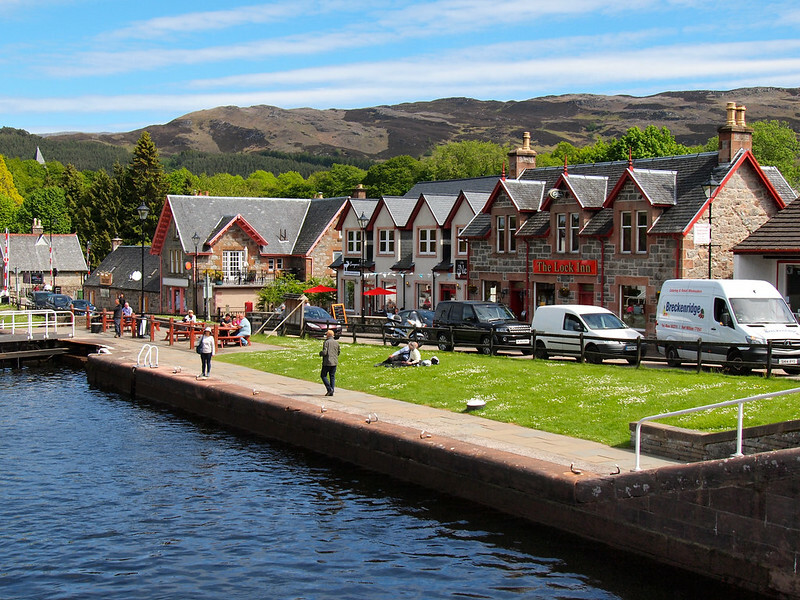 It has everything you could ask for, including castles, scenery and a whisky tour! And… now I’m homesick for Scotland. Scotland is such an amazing little place! I haven’t been to the Isle of Arran (shame on me, I know! ), but it’s definitely on my list! I just always have trouble pulling myself away from Skye! Great post! Very nice pictures! I would love to go to Scotland by ferry + my own car. I’m just a little bit “afraid” of (too) much rain… as hiking in the mountains and visiting small (old) towns is my favorite hobby. It seems to me now that I may not miss the Isle of Skye! And yes, I LOVE the Outlander books!! 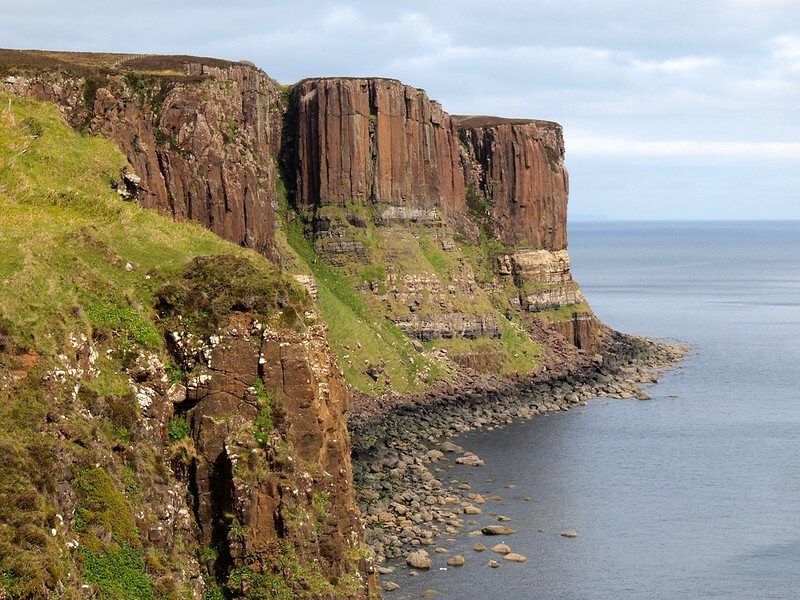 I’m planning a trip to Scotland with my boyfriend, and seeing the Isle of Skye is our TOP priority!! However, we can only swing a three day tour (Either the Skye High tour w/ Haggis or Isle of Skye & Highlands w/ Highland Explorers). 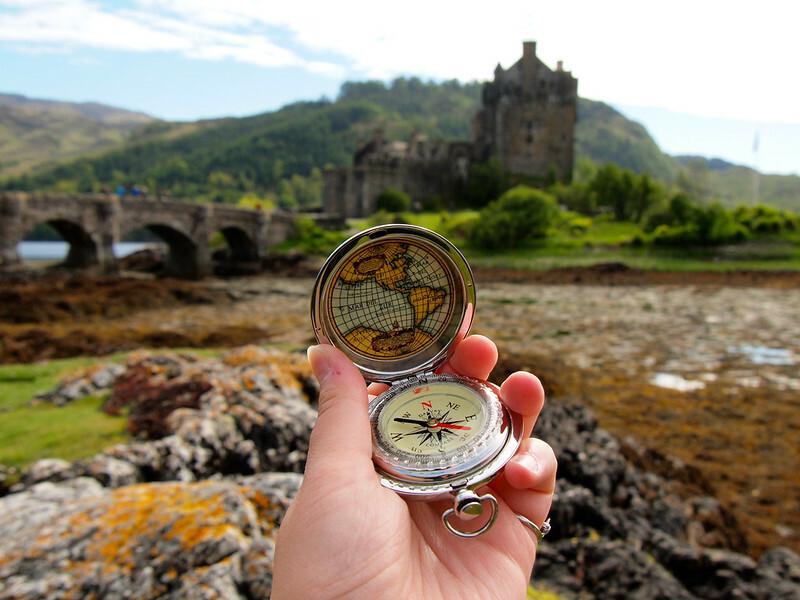 Would you say you have a preference between Haggis Adventures or Highland Explorers? Did one trip exceed the other overall, or especially in regard to quality time spent on the ground, really exploring and dwelling in the beautiful places you visited? Thanks!! All of your blogs have been SO fascinating and helpful. Making me so very excited for our own adventure. To be honest, I love both companies! Their tours are very similar (they share guides, so the enthusiasm and knowledge of your guide won’t be any different); the only real difference is the makeup of the tours. Haggis targets younger, backpacker-type travelers and has you staying in hostels. Highland Explorer targets a slightly more mature crowd and has you stay in B&Bs. So it really just depends which of those appeals more to you!